← Great Reasons To Love Grapefruit! Most of us love Mexican food but hate the fat that comes with it, right? Most traditional style Mexican food restaurants do come with a drawback of being prepared with ingredients high in trans fats but guacamole isn’t one of them. It does have fat but its most definitely the kind you need! Yes, we actually need fat, the good kind, to help us absorb vitamins, prevent deficiencies, keep our hair and skin healthy, control cravings, and keep you satiated. Avocados also offer a chock-full of nutrients including fiber, vitamin B6, C, E, K, folate, potassium, and super healthy omega-3 fatty acids just to name a few. Considering the fat content of avocados, heart health is actually improved. Oleic, the avocado’s primary fatty acid in conjunction with its omega 3’s makes this super food a winner for the heart. This fruit has also been proven to stop inflammation, so its an anti-inflammatory. A recent study found that persin, a natural compound found in avocado, slowed breast cancer growth by 99% and killed over 95% of the cancer cells! Smash up the avocado in the bowl you plan to serve it in with a fork until its pretty smooth. You can leave some chunks if you prefer it that way. If your avocado was small to medium then use 2. Mix in the flaxseed oil, lime juice and the plain dairy free yogurt in very well. Some brands that sell non dairy plain yogurt are So Delicious, Almond Breeze, and Whole Soy & Co. Our favorite is So Delicious plain coconut. Dairy free vegan yogurt adds calcium and protein as well as the benefits of live active cultures found in yogurt into this recipe. Definitely much healthier and lower in fat than adding sour cream. This is also the time to add your desired pinch of salt and pepper to taste. Himalayan salt is best for added minerals. Prepare all other ingredients on a cutting board, tomatoes, cucumber, radish, jalapeno, garlic, cilantro, etc..
Add all ingredients in the avocado bowl and gently fold it all in until the avocado smothers everything. Your done! Serve as a healthy dip with organic baked corn chips or better yet, vegetable sticks! Nutrition tip: Avocados increase the absorption of important carotenoids found in other foods by a whopping 200-400%! So slice up those raw carrot sticks to dip them in as well! 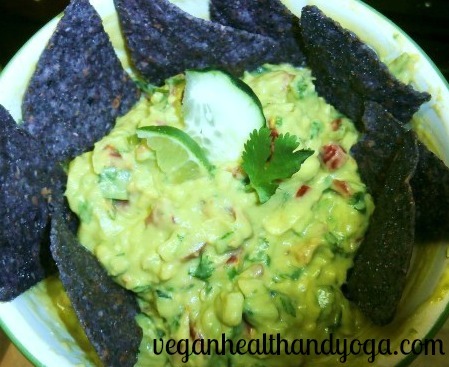 This entry was posted in Avocado Recipes and tagged avocado, cucumbers, guacamole, omega-3's. Bookmark the permalink.